Salomon Women's Propeller Dry Mittens, Black/Natural, Medium by Salomon at Laurenee Lifestyle. MPN: 0889645426549. Hurry! Limited time offer. Offer valid only while supplies last. Designed for dexterity and warmth, the propeller mitten dry for women has a waterproof softshell plus a leather palm for grip and feel. 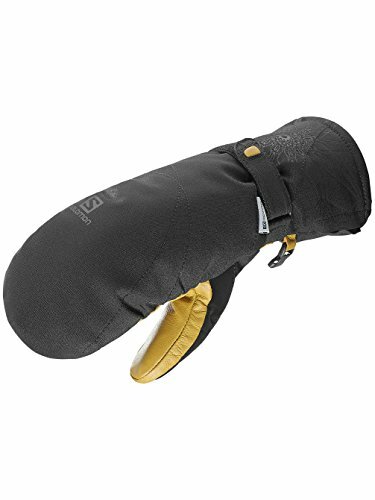 Designed for dexterity and warmth, the propeller mitten dry for women has a waterproof softshell plus a leather palm for grip and feel. .
Advanced skin Dry waterproofing protects against wetness and moisture. A leather palm helps these Mittens withstand frequent use. We Research, develop, and design all our gloves and Mittens to enhance your activity so you can enjoy yourself to the max.